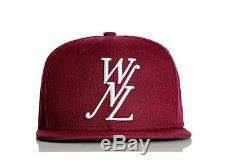 Public School NY WNL Snapback. WNL stands for We Need Leaders. Made in collaboration with New Era. The item "PUBLIC SCHOOL NYC PSNY WNL WE NEED LEADERS NEW ERA Snapback WINE ONLY 72 MADE" is in sale since Wednesday, August 10, 2016. This item is in the category "Clothing, Shoes & Accessories\Men's Accessories\Hats". The seller is "teriyaki_boyz" and is located in Taipei. This item can be shipped worldwide.